African American Stick Flag 12"X18"
If you are looking for high quality African American flags you have come to the right place. We stock and supply various size flags printed on epoly, wpoly and nylon. There is something to suit all budgets, from economy to premium designs. The premium flags come with reinforced corners and the premium car flags are suitable for high-speed driving conditions. Economy car flags on the other hand, are largely designed for city limit driving under 45mph. You will also find an excellent range of stick flags. From small American flags to larger, more domineering flags; you are sure to find one to fit your needs. Our leading American flag store allows you to purchase as many flags as you need. They are sold individually for direct customers or in discount bulk packs for retailers, distributors and wholesalers. We also offer custom designs for those looking to promote their brand. Our expert designers will help you to create the perfect African American flags logo to effectively promote your company. 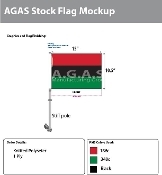 Contact the AGAS flag store today for more information. Philadelphia, PA, 19134 | Phone: 1-866-269-3524 | Fax: 215-689-4091 | Copyright © 2010-2019 AGAS Mfg Inc. All rights reserved.